Abscisic acid (ABA), a terpenoid phytohormone, was first identified in the early 1960s. ABA plays key roles in several processes, including seed maturation and germination, as well as in response to abiotic and biotic stresses. ABA has also been shown to affect stomatal movement, aiding plants coping with drought stress and pathogen attack. Due to the important roles of ABA in plant, the regulation of ABA signaling has been well studied at both the transcriptional and translational levels. Post-translational modification of key regulators in ABA signaling by the 26S ubiquitin proteasome pathway is well known. Recently, increasing evidence demonstrates that atypical turnover of key regulators by non-26S proteasome endomembrane trafficking pathways including the endocytic trafficking pathway and autophagy also play vital roles in ABA perception, ABA signaling and ABA action. The team led by Prof. XIE Qi’s lab at the Institute of Genetics and Developmental Biology, Chinese Academy of Sciences, summarize and synthesize recent findings in the field of ABA signaling. 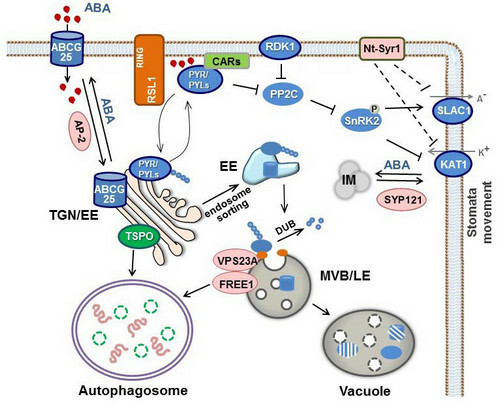 In this review, they reveals several trends in how non-26S proteasome endomembrane trafficking pathways regulate ABA signaling: (i) Non-26S proteasome, ubiquitin dependent degradation pathways are involved in ABA signaling; (ii) The endocytic trafficking pathway finely modulates the turnover of ABA regulators, and plays a role in ABA perception, transduction, and action; (iii) Autophagy participates in degrading diverse proteins, including both membrane-localized and soluble proteins in the ABA signaling pathway; (iv) RING finger E3 ligases were found to participate in both endosome-vacuolar trafficking and in autophagy pathways during ABA signaling. They believe that discovering more and more components of endomembrane trafficking pathway involved in ABA signaling will greatly improve our knowledge in the regulation of ABA signaling and other phytohormone signaling. This review entitled “Non-26S proteasome endomembrane trafficking pathways in ABA signaling” has been published online in Trends in Plant Science (https://doi.org/10.1016/j.tplants.2017.08.009). This work is supported by the National Key R&D Program of China.